So last year in 2014, I signed up for the Marine Corps Lottery and got in! Go figure. I had just bought my first home and so I probably shouldn’t have even tried to get into the marathon. I had run it the year before and it was awesome! A super fantastic experience especially for my first marathon. Hard to believe that it was in 2013 that I conquered my first marathon. Right after running that marathon in 2013, my boss changed at work and things got super stressful. I started to lose sight of why I was running these races and became a huge slacker. I wasn’t motivated and work was really stressing me out. I’ve always been a hard worker and tried to succeed to the best of my abilities and if I didn’t know a solution, I would find a way to find out so that I could learn. I was constantly told that I was always doing something wrong even if we came to the same result. I was told I wasn’t a hard worker or that I worked too hard and still was not an effective team member. Needless to say it was not the best work experience and I learned a lot. I was slowly losing my mind, but also losing my ability to believe in myself. I was so close to quitting my job because of it. It started to affect my health and mentality and it was not the best situation around. I found this company online (totally don’t remember how I stumbled across it) called Momentum Jewelry. It’s an awesome company. 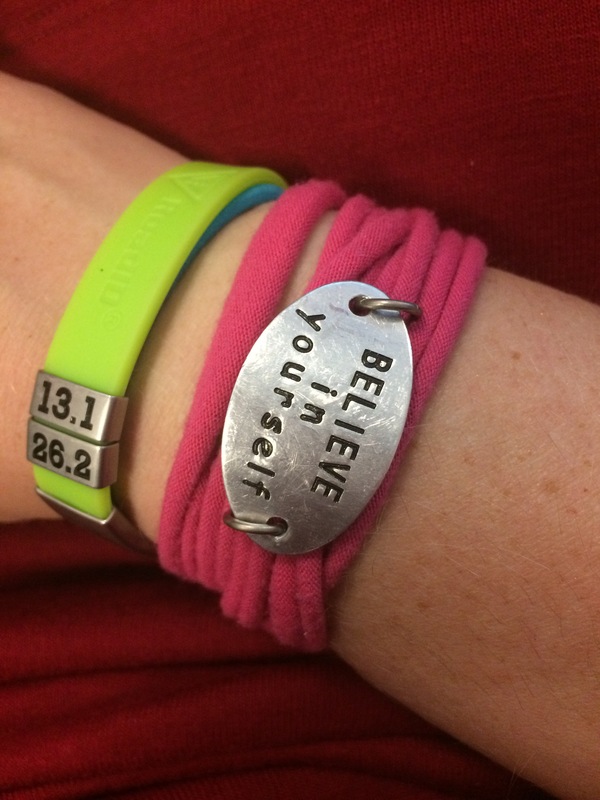 I ended up getting a wrap bracelet that says “Believe in yourself”. It’s a constant reminder that I need to believe in myself and that I’m doing the best I can with what I’m given. I need to get my training back on track for it. I will struggle but I will finish 🙂 Here’s to the last month of training…and to finishing the marathon! I believe in myself! My Momentum Jewelry wrap bracelet with my road ID that I wear as well! ****I was not paid for this post, it is simply my view and opinion and life EXPERIENCE.